In Israel, 40,000 people are estimated to suffer from fungal rhinosinusitis, and unprecedented figure and the first national estimate of this problem. About 800,000 (10%) Israelis are thought to suffer from rhinitis. 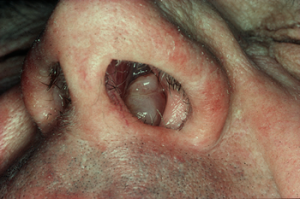 Fungal rhinosinusitis takes many forms and is often associated with asthma, but not always. The terminology for allergic fungal rhinosinusits is slightly confused in the literature, as was outlined by Chakrabarti and colleagues in a consensus meeting held under the auspices of ISHAM. The terms allergic fungal rhinosinusitis (AFRS), eosinophilic fungal rhinosinusitis, and eosinophilic mucin rhinosinusitis (EMRS) are imprecise and so AFRS has been adopted as an over-arching term. Other forms of fungal sinusitis include fungus ball of the maxillary (or occasionally sphenoid) sinus, granulomatous fungal sinusitis, acute and chronic invasive fungal sinusitis. In addition, an estimated 8,334 people in Israel suffer from allergic bronchopulmonary aspergillosis (ABPA) as many as 14,372 persons had severe asthma with fungal sensitisation (SAFS) in 2012. There may be some duplication in the ABPA and SAFS estimates because many ABPA patients have severe asthma and some severe asthmatics are sensitised to Aspergillus fumigatus. The estimates of ABPA, SAFS and allergic fungal rhinosinusitis in particular suggest a potentially significant proportion of patents with these conditions that are undiagnosed and therefore receiving suboptimal care. The chronic and relapsing nature of reactive airway diseases and the potential for serious exacerbations leading to hospitalisation and death underscore the importance of addressing this gap. In contrast, chronic pulmonary aspergillosis and Pneumocystis pneumonia are very uncommon in Israel. Ongoing surveillance, universal access to fungal diagnostics and improved availability of antifungal drugs were highlighted as immediate priorities for the reduction of morbidity and infection-related mortality in Israel.